The second you explain how the EAc6, Green Power credit works is the second your client starts to think how much it costs. The cost of renewable energy credits (RECs) varies tremendously, so be sure to shop around. 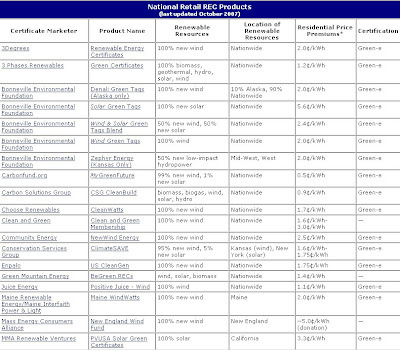 Thankfully the US Department of Energy has put together a handy list of REC products for you to choose from, though the list is a bit old (October 2007). Looking at the prices we're paying for a few current projects indicates the general price ranges listed are still more or less accurate. As you can see from the chart (click on the image for a clearer view), the price can range anywhere from $.005/kWh to $.056/kWh - a huge difference! After talking to Jason Wykoff from RenewableChoice, RealLifeLEED has learned that the difference can be attributed to a variety of factors including whether the company is generating power voluntarily or due to state renewable energy portfolio standards. If you want to get locally generated REC's you can expect to pay more than if you can choose a national vendor. For instance, South Carolina has less than optimal conditions for generating solar and wind, and our local utility's new program costs $.040/kWh, which is much more than the rate our company paid 3Phases for our office's 100% offset last year. RealLifeLEED is here to provide you with a handy guide for quoting average costs per square foot of RECs based on the DOE rates indicated and the Commercial Buildings Energy Consumption Survey average electrical intensity for various building types that can be found online or in your reference guide. I recommend the online guide because there's more detailed information that is helpful in other ways. Use these figures at your own risk! Prices fluctuate, and actual energy use for your project may be substantially different than industry averages. Did I miss something? Let me know via comments! The most recent price I have seen is about $.00196/kWh. While the Green Power Credit can be one of the most cost-effective credits to secure, it's more than just buying points. For many projects, purchased electricity usage is the biggest part of their environmental footprint, and RECs provide an immediate and respected way to address that impact.